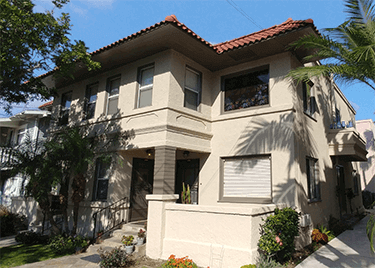 Patrick Miller Painting is a painting contractor that has been serving the Long Beach and Orange County areas for over 20 years. If you're looking for someone to paint one door, or paint your entire house, then I hope you give us a try. On every job we try to exceed the expectations of the customer through our commitment to perfection, quality and high standards. If you have any questions or would like a free estimate, then please give us a call at (562) 438-7373 or send us an Email. Please feel free to browse around our website so you can get a little idea about us. As you can see we are big fans of Benjamin Moore paints. We attend all seminars when new products come out to keep ourselves up to date on this ever changing world of the new E.P.A. VOCs "Volatile organic compounds" restrictions. This was a fun one The Henry Gage Mansion in the city of Bell was originally built in 1795. We had the privilege of painting this house a few years ago. It's named after our Governor Henry T. Gage who was in office from 1899 to 1903. 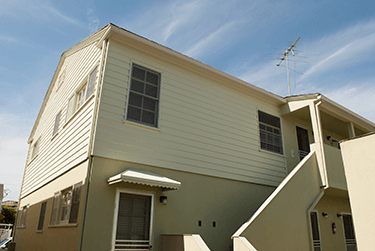 We understand that painting your house or rental property can be an intrusion on you or your tenants. We try to be as respectful as possible by coordinating the days activities in advance. We Take Great Pride in our cut lines. A good quality brush and years of practice can make all the difference in the world. For the most part choosing the right color is really a personal preference. There really is no wrong choice as long as you are happy. We will work with you throughout the prep stage by putting samples up to make sure the colors are correct. This is important to us. 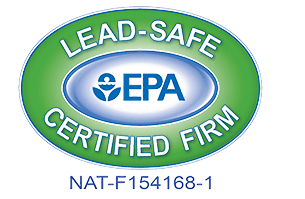 On April 22, 2008, EPA issued a rule requiring the use of lead-safe practices and other actions aimed at preventing lead poisoning. Under the rule, beginning April 22, 2010, contractors performing renovation, repair and painting projects that disturb lead-based paint in homes, child care facilities, and schools built before 1978 must be certified and must follow specific work practices to prevent lead contamination. EPA requires that firms performing renovation, repair, and painting projects that disturb lead-based paint in pre-1978 homes, child care facilities and schools be certified by EPA and that they use certified renovators who are trained by EPA-approved training providers to follow lead-safe work practices. Individuals can become certified renovators by taking an eight-hour training course from an EPA-approved training provider. Technology has come along way. This water base enamel acts and looks just like oil. This by far is our go to enamel for interior trim. If you're old school and think nothing looks or feels like oil then you might want check this product out. I doubt you will be disappointed. It won't yellow as much, dries hard like oil and just about looks like oil. One of my all time favorites for exterior trim is Benjamin Moore Aura series. The technology and the time that was put in this product makes it an outstanding choice for exterior wood. The low luster is a great choice for siding, the semi gloss is a great for trim. Regal Select is pretty much our go to line for interior walls and ceilings. The exterior line of this product is outstanding for stucco. This product has been around a long time with slight improvements over time. 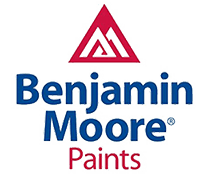 Basically this line has been the back bone of all the Benjamin Moore's paints. The new versions are now using the gennix tints which are great against color fading. We have been using this line for close to 20 years now and have never been disappointed. Patrick Miller and his team did a great job with the prep work and painting on exterior of our home. 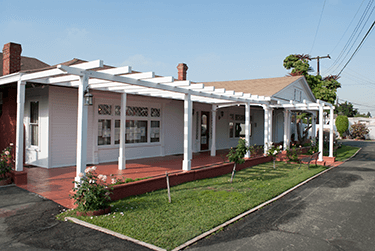 The house had not been painting in several years and required major prep work including repair of some areas with termite damage. His estimate was reasonable and even through he did major repairs there were no additional charges. For example, he found termite damage on the balcony which made the balcony railing unstable. He secured the balcony railing and did the repairs. He and his Team worked everyday, always arrived on time, worked the full day and did a professional job. I highly recommend Pat and his Team. It's always a pleasure to find that you've hired the right professional for a particular job, and that was certainly the case with Patrick Miller Painting. I called for an estimate in January, but Pat told me on the phone before he even came over that it would be about three months before he could get to the job. That's a very good sign when someone is that busy! 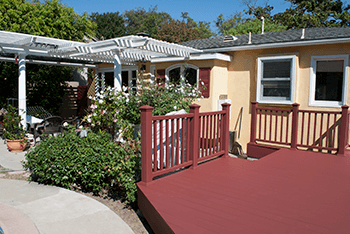 I actually had some other projects that needed to be finished prior to painting, so the wait was perfect for my schedule The price very much within our budget, and I didn't even bother getting other estimates as I could tell he was a pro. Pat and crew always showed up on time, and the job took just over one week. No drips, no missed spots, and they cleaned up every afternoon before leaving. All in all, it was a great experience having professionals working on your house. So, if you need your house painted, give Patrick Miller Painting a call. You won't be sorry. In a year or so we're going to be re-doing our interior, and it's nice to know I already have my painter! Patrick Miller and his team were AMAZING with our house. We had a very tight window for the work as we purchased a house, had new wood flooring installed, wanted it painted and then wanted carpet installed. We closed escrow late and had 2 weeks to do all of our work before we were leaving for the east coast for a month. Patrick came out immediately, gave us a very competitive quote. After having 3 other paint companies give quotes, we went with Patrick because he seemed like an honest, trust worthy guy. Sometimes you just get that gut feeling and we went with it. We were so luck, he and 4 guys showed up and worked really hard for a few days to paint every inch of our new house, and our baseboards. He came in under budget at that. He also recommended great paint and colors that were complementary to our new floor. His team was very careful with our new wood floors, put drop cloths down everywhere and did not scratch a thing. They were friendly, fast and did a fantastic job. We hired him again a few months later to paint a rental that we have. We would use him again, but won't need to because the house looks so good. Maybe when we want to changes colors...Highly recommended. Just had my two bedroom condo painted by Patrick Miller. 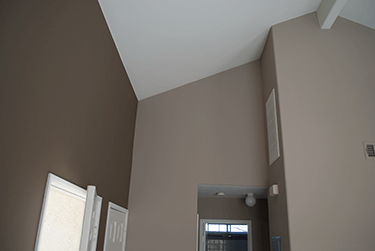 We have white vaulted ceilings with an accent wall, and Patrick and his team have very clean lines! They are perfect. Pat was easy to work with. He also gives creative advice - he called me during the middle of the job to suggest an idea for our living room and it is now our favorite part of the house. We are so happy with his work. I also see him painting exteriors on houses around Belmont Shore quite frequently, and they look amazing. Thanks Pat! Patrick is wonderful. He is professional and goes the extra mile to make sure the job is done well. He was fast and efficient from the moment we hired him to the completion of the job. His rates are reasonable. He is detailed oriented and did a thorough job on the exterior of our home. We will definitely hire Patrick again for any of our future painting needs.